2017 marks the first time that the Indian Air Force participated in the "Blue-Flag" training exercise, which began last week in Ovda AFB. 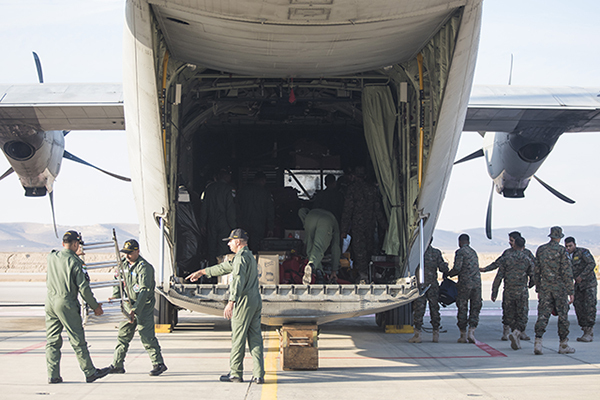 The Indian delegation landed a week and a half ago in Nevatim AFB with a C-130J "Super Hercules" tactical transport aircraft carrying 50 "Garud" Commando Force (the Special Forces unit of the Indian Air Force) operators and aircrew members. 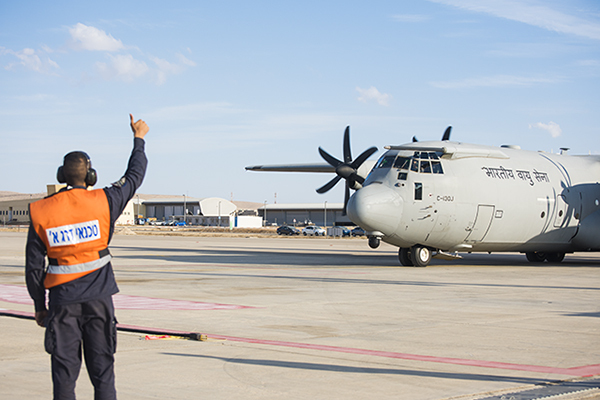 The cooperation's focal point will be an aerial special forces training exercise held at Tel-Nof, Palmahim and Nevatim AFBs alongside the Israeli 103rd Squadron (“The Elephants”), which operates the "Shimshon" (C-130J) aircraft and SAR Unit 669. "Flying in the 'Blue-Flag' isn't like a regular training flight. The rules of the game change in an exercise as large as this one and the aerial playground is designed so that the scenarios are as effective for the participants as possible", explained Capt. Itamar, the exercise leader from the "Elephants" squadron. 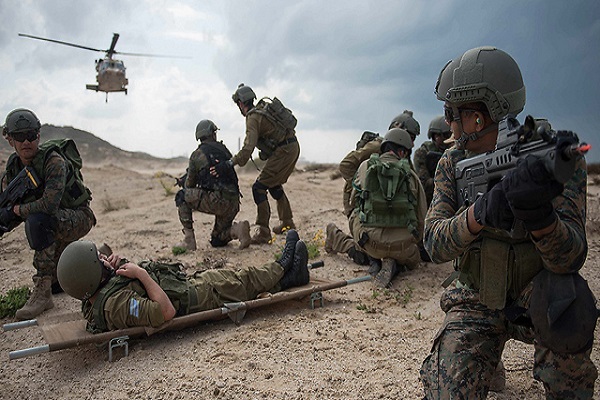 The air forces' cooperative training exercise will include both ground and aerial missions such as urban warfare, navigation and downed pilot search & rescue. At the end of each week, the commandos will perform a conclusive training session including various scenarios such as raids on tactical facilities, extraction, airborne transportation via “Yanshuf” (Black Hawk) helicopters and mutual formation flight. 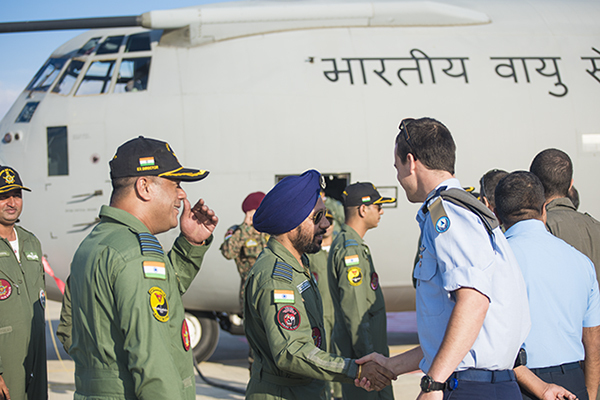 "This is the first time that the Indian Air Force is participating in the 'Blue-Flag' training exercise, so this cooperative interaction is of major importance", said Capt. Itamar. "This is a very large-scale exercise, larger than we've ever experienced. We are rehearsing scenarios that we don't get to rehearse every day as they are complex and involve aerial threats. An exercise of this scope and quality requires extensive preparation, infrastructure and planning". The "Garud" Commando Force is a Special Forces unit in the Indian Air Force responsible for close support, combat search & rescue and downed pilot search & rescue, among others. "In the exercise, we are placing an emphasis on teamwork and the ability to cooperate with infantry forces on the ground, as well as strengthening the cooperation between the combatants and aircrew members in order to minimize the helicopters' time on the ground", said Capt. Tal, a SAR Unit 669 operator and the unit’s exercise leader. "One of the main challenges we faced while planning the exercise was the attempt to adapt its content to both forces. The Indian unit is different from SAR Unit 669, but there are many similarities". "During the first week, we performed an acquaintance sortie across the country in which we flew from the north to the south in order to familiarize ourselves with our training ground. Later on, we will perform similar sorties in a more tactical fashion, including field landings and night flights. Afterwards, we will fly in a formation with an IAF ‘Shimshon’ and an Indian C-130J", noted Capt. Itamar. During the second week, the aircrews will take part in the "Blue-Flag" exercise's aerial combat scenarios. Both air forces see a mutual future: Israeli crews are due to fly to India in two "Shimshon" aircraft for a two-week deployment. They will fly with their Indian counterparts in a topography completely different to the one in Israel. "It's amazing to see how people from the other side of the planet, who live a different lifestyle and speak a different language, are actually very similar to us", concluded Capt. Itamar. "Flying in identical aircraft showed us how similar our missions and challenges are and we definitely have a mutual language. The Indians are warm, open people – we've become friends".